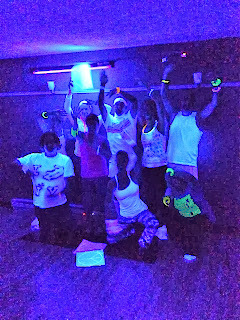 Another week, another themed yoga class: Glow in the Flow. Yes, yoga under the blacklight. Let's forget that it could have turned out to be a huge Wham! "Wake Me Up Before You Go-Go" disaster (as if the song wasn't horrific enough!). David and I discussed whether to go or not, mostly for two reasons. As much as we like Bree, her last two classes were a little two low key for our liking. Yes, now and again we need a good stretch, but not for 60 minutes where you don't break a sweat. The other one was, this Glow class threatened to have a 'dance' component. Ick. I won't dance....don't ask me. I have been to other classes where the instructor tells us to dance. Chances are you'd see standing still with my arms crossed. Dancing, drunk, in a bar is one thing - and even then I'm self conscious. Yet, we opted to go, though truth be told, I forgot about the dance element. Selective reasoning, I suspect. 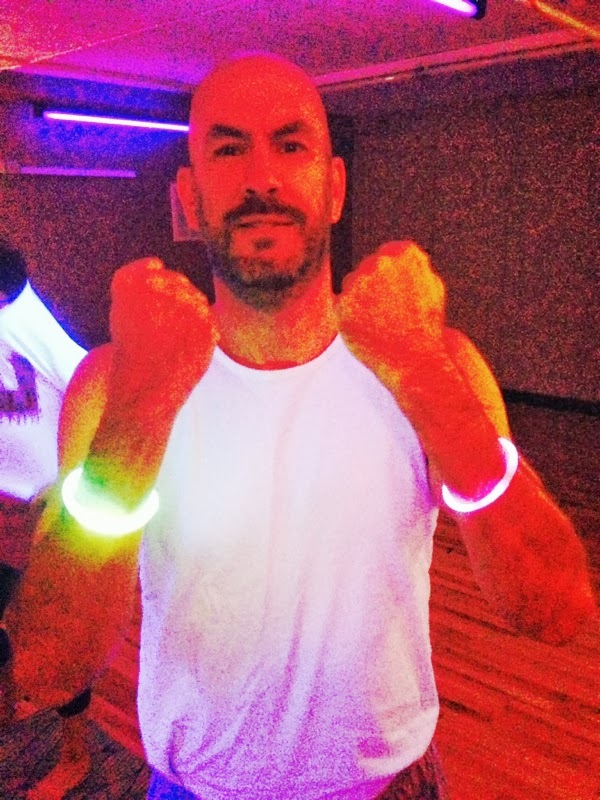 Since it was Glow - white or neon clothes were encouraged. 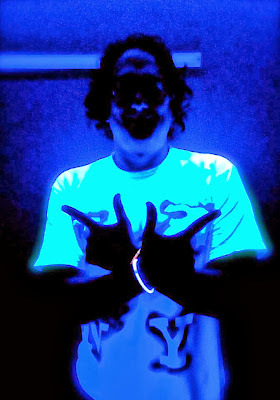 Since I'm not a Disney 'tween "star", I own no neon. A white sleeveless shirt would have to do. I own no white shorts and even if I did, it is after Labor Day. Bree was providing the glow bracelets. I took three and opted not to connect them to make a necklace. This pic I took reminds me of something out of Laurie Anderson's Home of the Brave. The guy on the right had his Ted hose like things on and that band over his neck looks like it might have covered a thoracotomy. The take-away was that no one seemed to be hitting the teeth whitening solution too hard, but you could see every dirty bit of one's yoga mat. The class was good though - and it was more 'free movement' while in Chair or Warrior poses - but it got just a little to close to 'dance' if you axe me. And while it probably wasn't technically hot yoga, the classroom was warm. Naturally, David had the best picture of the evening - even if I took the snap. But if I had to end the evening on a bad note - and I do - don't ever let your cat play with those glow things. Sophie bit through one as soon as I let her play and she went nuts - but not in a good way. I immediately jumped on-line, and found out the things are non-toxic but leave a horrid taste in their mouths. First I had to catch her, and she was foaming at the mouth, and drooling everywhere. The intertubes told me to get her water, milk or anything she might enjoy eating to get that taste gone. But what also happened was that the liquid from those glow bracelets also got on her fur, so we had to give her a bath - which as you might suspect, was no fun, for any of us. I will give it up to our little trooper. After we dried her off, she was back next to one or both of us and then slept with me all night long. Whereas she didn't have any hard feelings, I was flooded with guilt all night long. LOVE all the song references in this post. and yeah, the pix look a bit wham-ish. gotta hand it to bree to make your classes interesting. 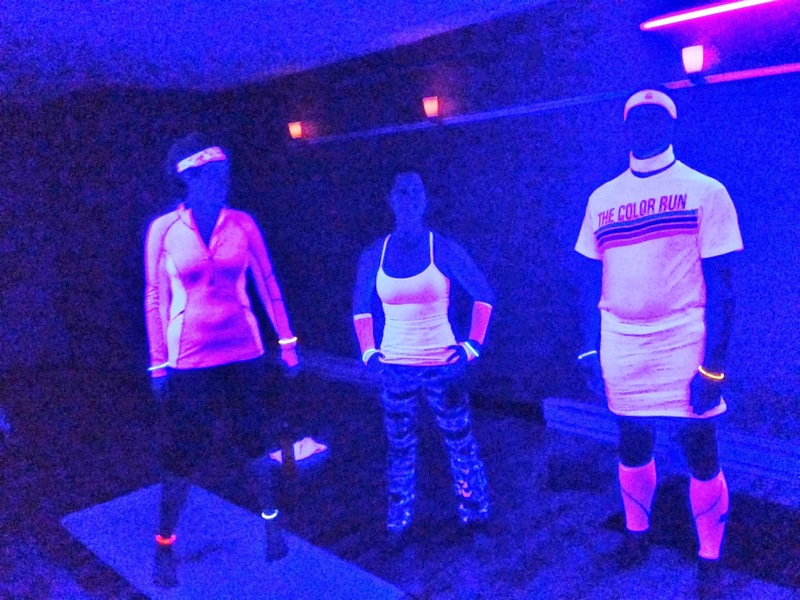 Hmmm....under all that black lighting I hope "spots" weren't revealed on the mats. Poor Sophie. I can tell you from experience that glow sticks do, in fact, taste disgusting. I like that your yoga gal thinks outside the box and tries to change it up now and then. Sorry about Sophie. Cats tend to freak out and become hysterical when they get scared. Reminds me of the time our cat got a plastic grocery bag handle looped around his neck. The faster he ran around the house, the more his "parachute" fluttered and scared him.